Edited: Hey everyone, just popping in to answer a few questions. 1. The Weight Watcher's cook book that had the coconut pie recipe is called WW 5 ingredients, 15 minutes...it's one of those magazine type cookbooks and the date said display til Feb 19, 2008, so not sure if it's till available. 2. 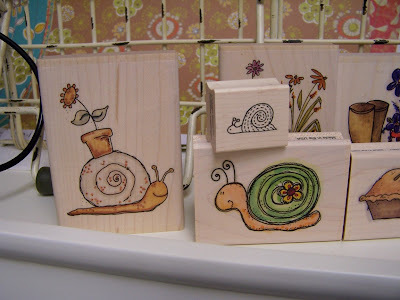 The two large snail stamps are from Whipper Snapper and can be found under the Sea Life category, I believe. The small snail is a Karen Lockhart creation and can be purchased at Ellen's online store. 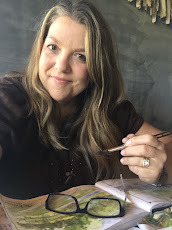 DeeDee, your snail card on your blog is adorable.....I have a friend that has that Cricut cartridge so I can get some cut from her. Thanks for the head's up though, cute!! Isn't funny that the snails are in such demand right now!? 3. 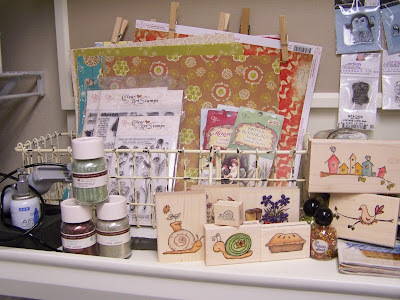 Winners for the Crafty Secrets prize drawing will be announced tomorrow, along with another Crafty Secrets prize drawing! Sandy from Crafty Secrets is so generous, she wants to give away MORE goodies!! Here's my new Inspiration Station. My theme this time seems to revolve around NATURE. I get so inspired this time of year from all of the singing birds, the green grass and blooming flowers, garden seeds and plants, the sounds of frogs in the creek, muddy boots and dirt in my fingernails, warmer weather.......ahhh, I love this time of year! 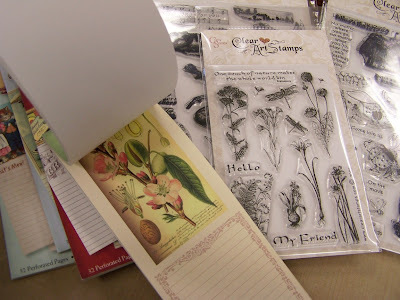 I found this collection of SEI papers called Dill Blooms and I LOVE IT! I really love the look of these basic botanical images with their long stems, spiky blooms and colorful leaves. And the colors remind me of the 70's colors I grew up with....burnt oranges, olive greens, browns, golden yellows, creamy colors and turquoise. I had fun shopping in my own stash of adornments. I love to dig through all of my ribbons, buttons and flowers for goodies to add to my projects. And the botanical images are very noticeable this year it seems. 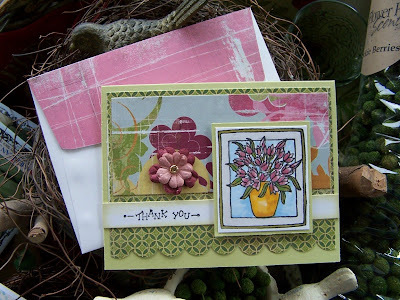 These stamps and cut images are new from Crafty Secrets. Love them! And SNAILS. I dunno why but these little creepy critters have won my heart over. Now I'm looking everywhere for snails! Now this next batch of goodies switches gears a little bit. It's bright, it's fun, it's girly, it's cheerful......it's FUN! It's a series of papers from K and Company called Berry Sweet, I believe. Still very nature oriented though but on the bright side.....lots of funky and fresh flowers, butterflies, cherries, strawberries, owls, fish and more. 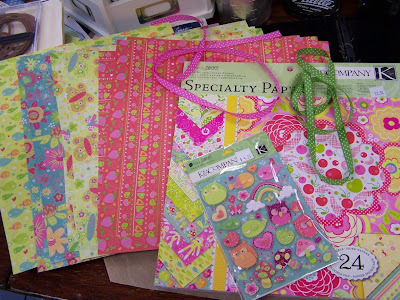 I'm loving these papers for little girly gifts and stationery. 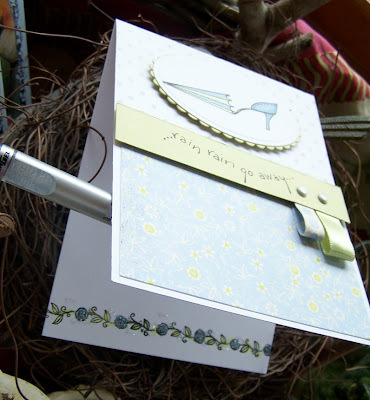 And here's one of my first cards made using the SEI Dill Blossom papers. 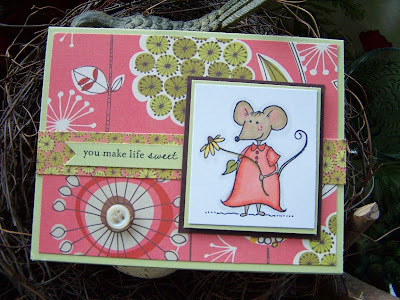 I paired it up with the Whipper Snapper stamp called Louise, designed by Sweet Miss Daisy herself....Anna Wight! This image caught my eye because when Josey was a wee little girl, I would lay in bed at night with her. A little mouse (my index finger) would sneak beneath the covers and come visit Josey every time I layed down with her. Mousy, as Josey named her, would talk to Josey and wiggle around and tickle her, and rub her arm.......all under the covers because she was too shy to come out. Ohhhh, how Josey loved that little *mouse*. She would pet her and hug her and give her kisses....I can still hear her sweet little voice say *hiiiii Mousy*. And when we moved to our new house in the country, amazingly Mousy moved with us!! Oh, the memories we make. I think I'll mail this card to Josey and sign it from Mousy. She'll get quite a kick out of that! Okay, enough of memory lane. I've got sweet party mix to make for the big Girl Scout trip my girls are going on this weekend. I'm Nervous Nellie thinking about my girls being gone for three days!! But I'm still going to take advantage of the free time and make a date with my favorite fella. Dinner? A movie? Buy some flowers for the garden? Hmmm, who knows! EDITED: Here's the recipe in typed format. For Nessie in the UK, Cool Whip would be the same as whipped cream with a little sugar in it. As for my recipe binder, here's the information I have: C.R. Gibson 1-800-243-6004 or go to the website HERE. They still have the recipes books and the refills. The refills I have are the QP12 size which fit two 4 x 6 recipe cards. As you know, my husband and I have been dieting. We're kind of at a stand still right now but we are refocused this week and are back on track! One thing that I cannot resist is dessert. But instead of a big pan of cookies or decadent pies, I make desserts less often and usually in individual serving sizes. 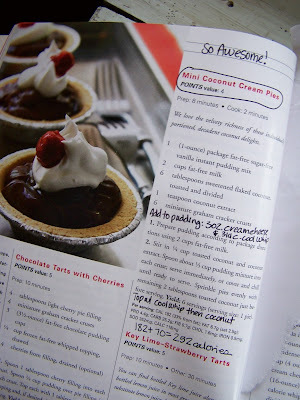 So when I found this recipe in a Weight Watcher's cookbook for Mini Coconut Cream Pies, I drooled right on the page!! 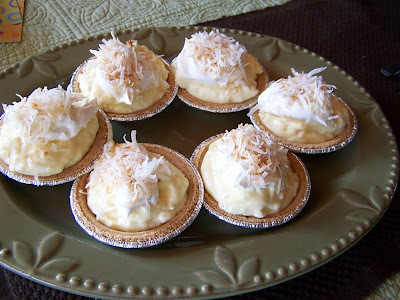 They taste exactly like homemade coconut cream pie. My family deemed these as *a keeper*....that's what they always say when they like a recipe! Here's the recipe in the actual cookbook. I usually have to tweek a recipe here and there so I end up scribbling all over the recipe book. It's not very often that I make a recipe exactly as called for. So I was having so much fun making recipe cards that I decided to make another. 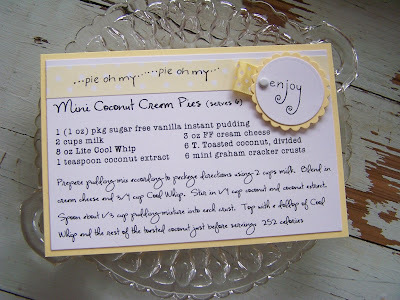 I didn't have a coconut cream pie stamp (LOL!) so I had to improvise. I chose the *pie oh my* and *enjoy* stamp from Karen Lockhart. I typed out the recipe on my computer and printed it out on white cardstock. The fonts are called CK Becky for the script and AFL nonmetric for the type style print. Friends sent those to me so I'm not sure where to acquire them. Coconut Cream Pie is always a creamy yellow color so Papertrey's Lemon Tart cardstock and matching polka dot satin ribbon were just the colors I was looking for. I cut the *enjoy* circle out with Spellbinder's circle and scallop circle Nestabilities Die Templates and used a white brad to secure the ribbon snippet. 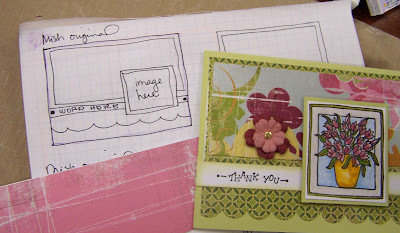 Note: Don't forget to sign up for the Crafty Secrets Images and Journal Notes drawing. Go to yesterday's post and leave a comment. I'll draw two winners tomorrow. Isn't funny how there always seems to be the perfect stamp for what you're wanting to say? My husband would say it's just plain sick to have so many stamps. There, there dear...get over it, the stamps are staying!! 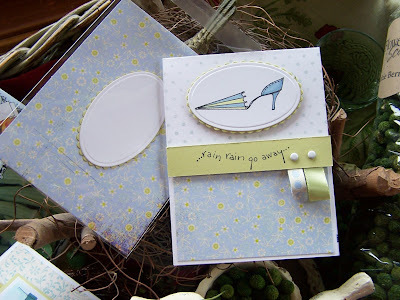 This is my first time using Karen Lockhart's Umbrella Shoe stamp and rain, rain, go away sentiment. It's just perfect for this time of year...the rains just keep coming when all we want to do is be outside. Here's the layout I based this sketch on, another one for you sketch book. After stamping and coloring my image with Copic markers, I cut and embossed it with a Spellbinder's Oval Nestabilities Die Template....then on a green scallop oval then pop dots. Instead of a word tab below the horizontal strip, I used two snippets of folded ribbon and white brads to keep them in place. Paper is Papertrey Spring Moss and the floral is by Basic Grey, I believe. Backgrounder polka dot stamp is from CHF. Notice how I raised up the horizontal sentiment strip on pop dots too. 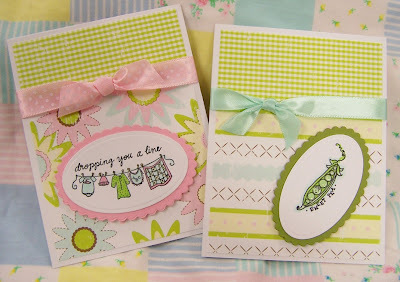 This brings more focus and dimension to the sentiment and also nicely conceals the ribbon snippets and brads. I also stamped a Lockhart border called Rose Ribbon on the inside of the card. Kinda like flowers that bloom after the rain showers. Here's a closeup of them....all colored and glitterfied. Now you may have noticed this piece in the top photo. As you know I'm into this whole stationery look. So I decided to add some fun to this card by sending it in a clear envelope. 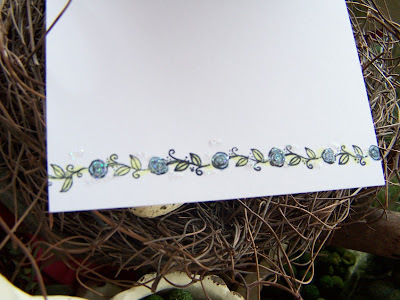 This piece of patterned paper will slip into the envelope with the finished card. Two separate pieces...the card front will show on one side and this piece will show on the other side through the clear envelope. On this piece, I can write the recipient's name and address so it will be all fancy like. I think I'll write my return address along the left hand side, going up and down. The postage stamp will go on the outside of the clear envelope and will go through the postal system just fine. And my mail lady will love to see a little eye candy! 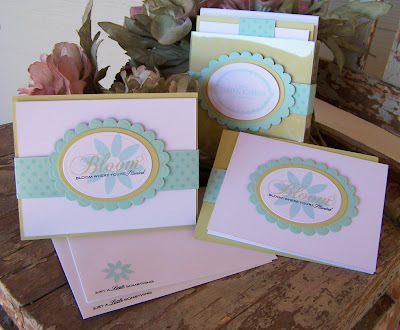 And when I get cards in the mail from my stamping friends that are in clear envies.......pure delight because I get to see the beautiful card right away! 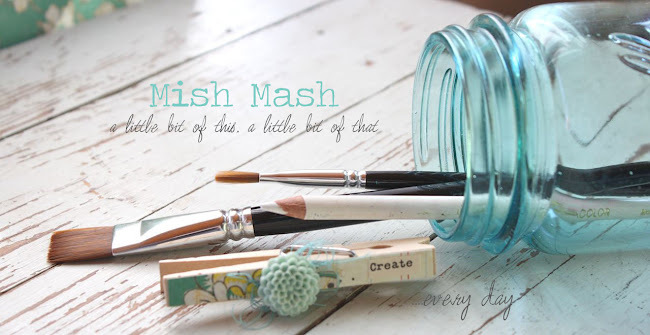 Just a fun idea for you! 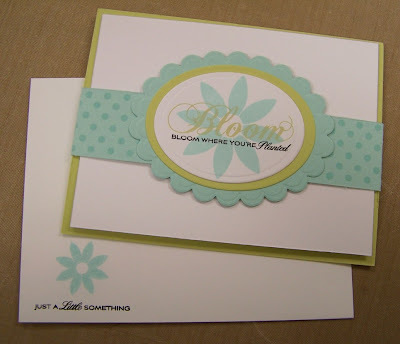 Clear envies are available through Stampin' Up! and other companies that sell stationery/gift wrap supplies. Now I think I'll go pull a few more weeds out of my flower bed before it rains! To me, the sandwich is the perfect meal. It's all inclusive, everything's in there! Now to my husband, he thinks sandwiches are bread and bologna or peanut butter and jelly. But to me a sandwich is a gourmet little morslet of a food mountain. 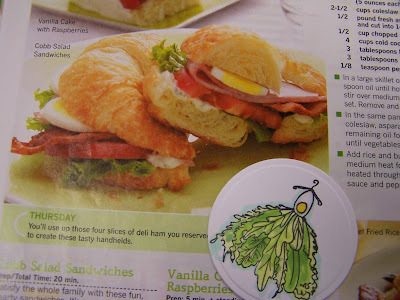 This is my newest sandwich that I found in Taste of Home's Simple and Delicious magazine. Great recipes in these little cookbook magazines, I've subscribed for years. This one's called Cobb Salad Sandwich. All the goodies from a Cobb Salad are topped on my favorite buttery croissants. Serve this up on a cute little plate with a Diet Coke and life is good!! 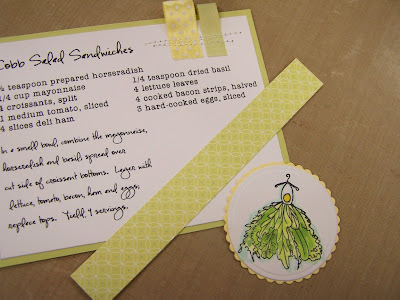 The little slice of hard boiled egg immediately reminded me of Karen Lockhart's Egg Salad stamp.......and so the inspiration was brewing. When coloring an image like Egg Salad, simply pick out a bunch of Copics that are somewhat close together on your color chart. There is no need to be overly detailed when coloring images like this......just dabble on some colors and you've got salad! 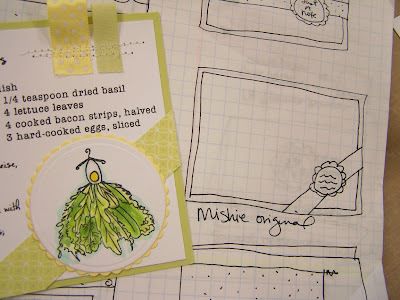 I thought this sketch would be a great layout for a recipe card....simple and lots of room for the computer printed recipe. (I promise that some day I'll do something with all these sketches, I hear your requests!) 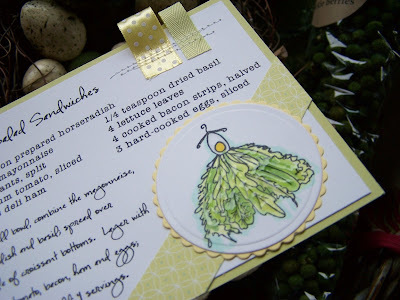 So here's my finished recipe card. I usually make them 4" x 6" but I forgot and made this one the size of a regular A2 card. Still works for me. I followed the sketch closely but also added some ribbon snippets and some of my *messy stitches* to the white space in the top right hand corner of the recipe card. I cut and embossed the main image with a circle Nestabilities Die Template and then matted the image on a scallop cut Nestabilities circle. Oh, I just love that look, it's like icing on the cake.......or mayonnaise on the sandwich! 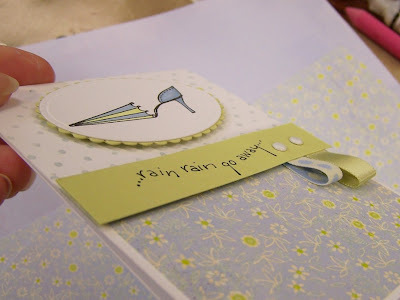 To add the corner strip of cardstock, all you have to do is cut a strip of patterned paper that hangs over the edges of your project. Adhere it down with adhesive. Then turn your project over and snip off the pieces that hang over. By cutting from the back side, you get a really straight cut right along the edge of the main piece. Attach the stamped image and it's done! Zoom in on the photo below...you can see that I used Ranger Glossy Accents on the lettuce. Love that look! I've already added my recipe card to my recipe box. Can't wait to serve these sandwiches to some friends. 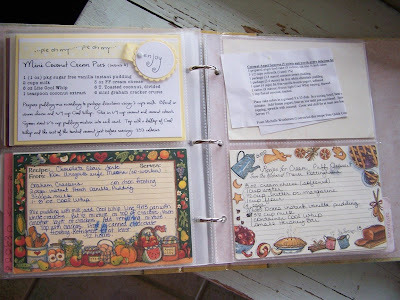 And if I had time, I'd make a handmade recipe card for each and every one of my recipes. I LOVE seeing the handmade ones when I open up my recipe books! 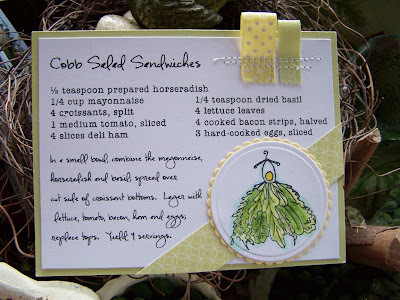 Supplies: Egg Salad stamp, Papertrey cardstock and ribbon, Spellbinder's Nestabilities, Copic markers, Ranger Glossy Accents, computer generated recipe. Today I'd like to show you the stamp of the month over at Ellen's online store. It's the Tulips stamp from Karen Lockhart. I paired it up with the Lockhart Thank You sentiment, some Basic Grey Perhaps patterned paper, Prima flowers, Copic markers and Ranger Glossy Accents. 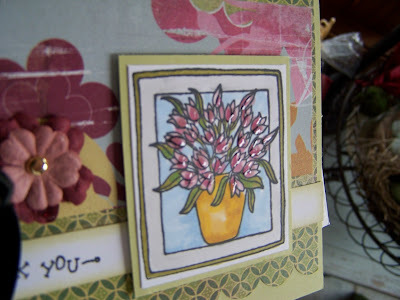 I colored the tulips to match the beautiful colors in the patterned paper and on the envelope. I love the solid scratchy papers that come along with the patterned paper pads. They make the perfect accents for layering or in this case, the envelope flap. Here's a closeup of the tulips. I don't have one single tulip left in my yard. I think DH either mowed over them too many times or the deer ate them all up. They just don't come up anymore. But I always love flowers in the early morning when they were all dew covered. By using Glossy Accents, I was able to achieve that dewy look by dotting each tulip with a little coating. Just a pretty accent to this card. I know how much you love the sketches so I snapped a photo for you all. 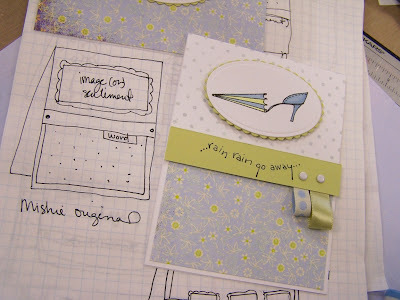 This is a great layout because you can easily use two patterned papers from a collection. I've also added in that horizontal strip that I love to use so much on cards. It's the perfect place to add a sentiment and it tucks right under the main image. I made the scallops on the bottom by using my SU! slit punch. Well I'm off to work in my stamp room today. Storms rolled through Kansas yesterday.....as they say, April showers bring May flowers. And in Kansas, along with those showers come tornado warnings! I'll be watching the weather closely today for sure. Have a good day everyone!! I made this notecard ensemble for the Papertrey Ink contest a few months ago. I call these Hidden Notecards and you'll see why in a little bit. I packaged the notecards in a clear plastic stationery box that has the top 1/2" or so cut off. There's a big magnet on the back so that I can keep these on the side of my fridge and can reach for a notecard without having to open the box each time. All supplies are from Papertrey Ink. Here's what the notecard looks like from the front. It appears that the oval accent is adhered to to the polka dot strip and that this is just a card front with all the pieces adhered firmly. But actually the scallop accent is attached to the front of the notecard and then the notecard slips out from behind the polka dot strip of cardstock. This is where the hidden notecard comes into play. 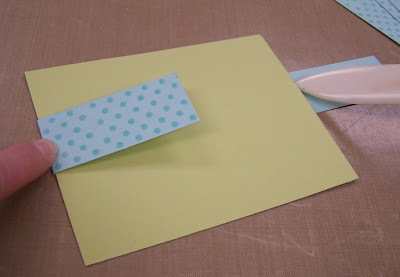 The base green piece of cardstock is 1/4 of a sheet of cardstock(no folds) and the white notecard is folded so that you can open it up and write in it. Here's what the notecard looks when out of hiding. You just slip it back to the card base when you're done with the writing part. 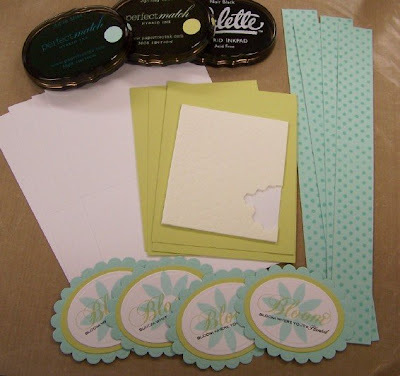 I used Spring Moss for the card base, Aqua Mist for the polka dot strip, along with the Polka Dot Basics stamp set and white cardstock for the folded notecard. LOVE the polkadots! The polka dot strip goes all the way around the card but there will be a gap when you fold the two pieces on to the back of the base card. 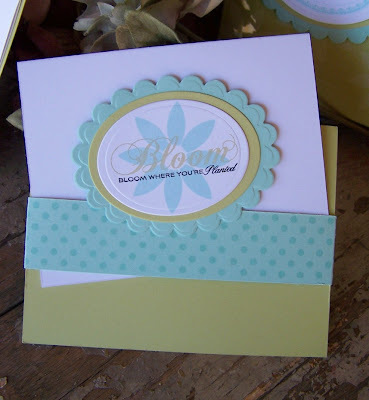 That gap is easily covered up by an oval cut piece of cardstock which makes the perfect *handmade by* accent. For the stamps on this piece I used Beautiful Blooms and Just Hatched. The cardstock strip is only adhered on the back, no adhesive is used on the part of the strip that is on the front of the card. 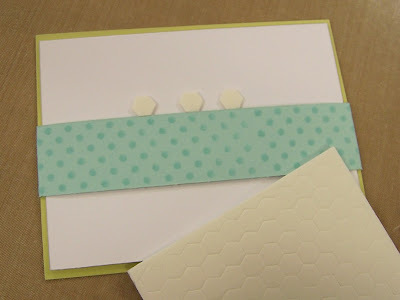 Then on the front of the notecard, place 3 pop dots right above the cardstock strip. Then center and place the main scalloped oval accent piece on the pop dots. This precise placement of the pop dots will ensure the proper stopping point for you to slide the notecard into place. I used three different oval Spellbinder's Nestabilities to make the main accent piece. 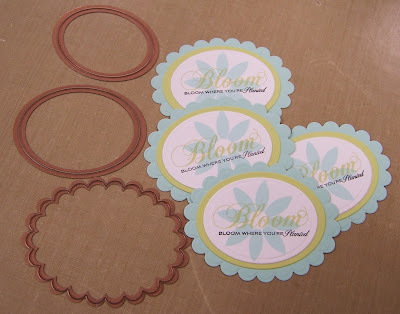 The top white oval and the bottom scallop oval are also embossed which looks so professional. 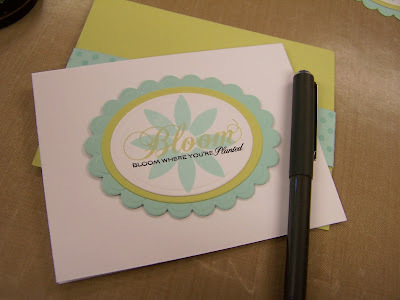 Stamps used are Beautiful Blooms and Spiral Bouquet with Aqua Mist, Spring Moss cardstock and ink, and also Palette Black Noir Ink. I just love coming up with unique cards like this. Hope you enjoy!!! Hello everyone. So you know I love birds right? Well look what this little pair of birds built right outside our front door! This is such an interesting nest. It has hay soft grass in the middle with this mossy stuff on the outside. And we had just picked matted hair off the cats so lots of that made it into this nest too. I even cleaned the girl's hair brushes and layed some of their hair up there......the birds LOVED that. The nest now has this soft lining of red hair! 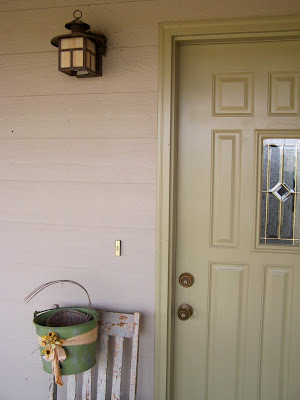 Problem is that the nest is right on top of the light fixture which is next to the front door. And that chair is where my mail man and UPS guy leave my packages. 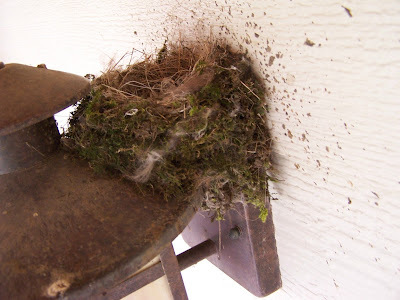 Dear Husband was not happy about this nest one bit. Said the birds would poop all over the place. 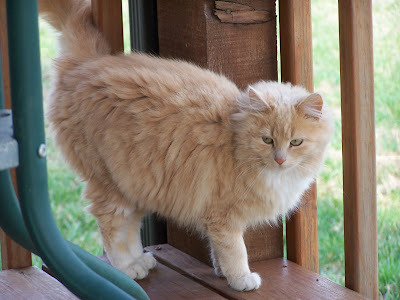 Then there's this little cutie named Frisky. She's a real bird watcher too....not so good for the birds. And here's Hammy and Emma. Look at Hammy, he's already licking his lips!!!! Well, Dear Husband decided to let the birds live there because he knows how much I love them. He's a nice guy with that kind of stuff. So what happens then? He goes outside the next day through the front door. Marches right back inside and carries me his favorite KU t-shirt and blurts out, *LOOK WHAT YOUR NICE BIRDS DID, THEY CRAPPED ALL OVER MY FAVORITE SHIRT!! * After I spewed my drink a little bit, I told him that back door guests are best....use the garage door, dear!! The nest is staying. So then Jordan and I got creative and decided we needed to make a sign. We thought it should say *Beware of the Birds*.......but I think now it will read *Every Birdy Welcome*. Jordy got some REAL artist watercolors for her birthday last year so we paint every chance we get. 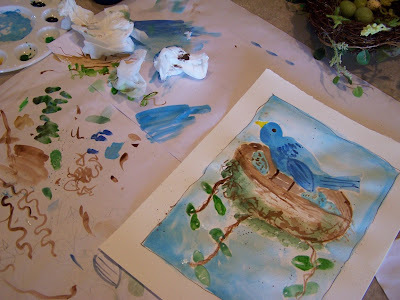 I helped her sketch out a bird and a nest and had a little coloring lesson. Didn't she do good? I need to add the words and frame it. Then it's going to hang outside under the light with the bird nest. I'll post the finished creation later. And guess what? Eric boosted Jordy up to see the nest today....FOUR speckled tan eggs. Which means they're just simple barn swallows. Which annoy the heck out of my dad when they get in his barns. But Jordy and I love them and we can't wait to see the babies. Although they will be dead ducks if they fall on the porch while learning to fly. Our kitties are bird stalkers!! More later on the bird story! TGIF everyone! It will be a short post today. I am SICK.....head cold, non stop coughing and probably a touch of the flu. Not enough to keep me down, just enough to keep me running in slow motion though. Thank you so much for all of your kind words to my postings. I love to hear your thoughts and that I inspire you. What a great thing to be able to do.....inspire someone! Well on to today's post. 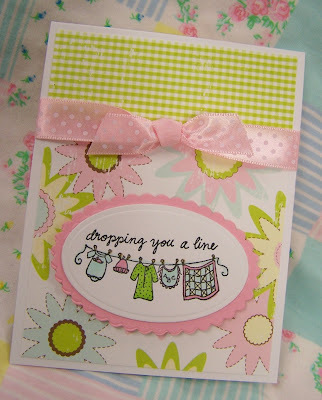 These are some more little baby cards that I'm going to be giving to my niece once she has that sweet baby girl. I know she will appreciate some cards that can be used for thank you's, etc. Patterned paper from Making Memories Garden Party collection, ribbon from Papertrey Ink, Palette Black Noir Ink Pad. Copic markers and stamp images from Ellen's online store. I thought this card would be cute for Chelsey to send out with an updated baby photo. It seems most baby cards are geared only for thank you notes, but this one could be used that entire first year for almost anything. The image is called Clothesline and is by Karen Lockhart. Sentiment is from A Muse. This card could be used in the same nature as the card above. Baby themed but generic enough in nature that it could be used for anything baby related. I'm particularly hoping to receive lots of updated photos of that sweet little bundle so maybe if I give her lots of cards AND postage stamps.....with all of the envies addressed to me..........she'll get the hint! 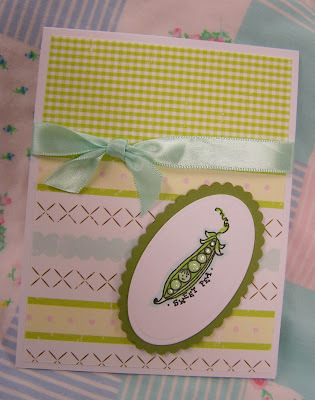 This image is another Karen Lockhart stamp called Sweet Pea in Pod. 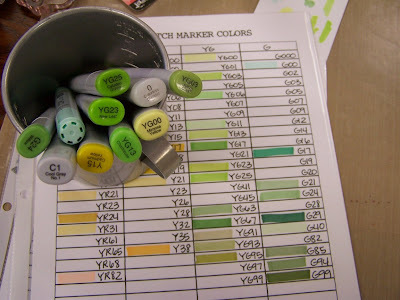 One tip on Copic markers....when coloring images that are basically one color....like peas......select 2-3 colors right next to each other on the color chart. These markers will be just a shade or two darker or lighter and you can get some great shading without a stark contrast. 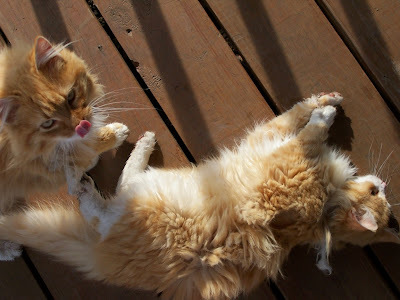 Okay, I'm outta here for today my beautiful blogging buddies! Coming soon: my new Inspiration Station, some step by step Copic coloring (just to refresh) and some Crafty Secrets prize drawings. Today's project will have you wishing you were 13 years old again. As a child, I loved stationery. It wasn't very often that I got new notepad or notecards or new pens. But when I did, I would savor them like a fine piece of chocolate. I was hoarder though, I didn't want to use my goodies because I might run out. Oh, and stickers.....they were like morslets of sweet stickiness to me. If you actually received a sticker from me, you were a lucky girl! 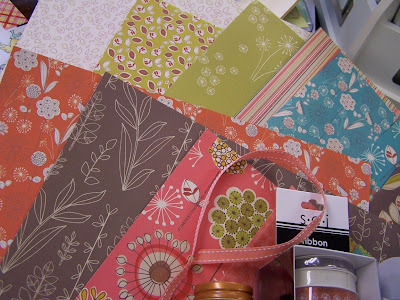 Now, fast forward to 2008 and I still love stationery and all things created in the name of patterned paper. But do I hoard stuff? Not very often. That comes as a shock to many of you right? Well aside from getting a great project today, you will get some hoarding tips. Let's begin. Today project starts with K and Company patterned paper (found at my local scrapbook store). Hoarding Tip #1: Stop purchasing onesies of everything. 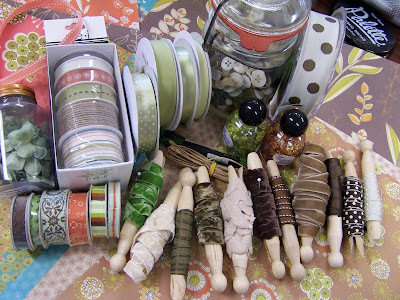 Instead, shop with a theme in mind or find a certain collection of supplies that you just adore. Purchase a lot of stuff from the same line like papers with matching ribbons, buttons, bling, bling, stickers, etc. 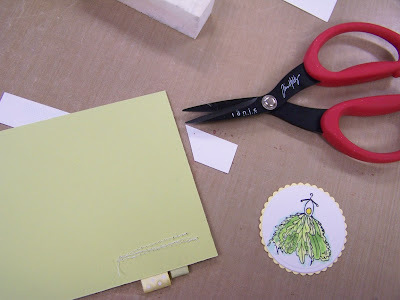 This way, you can actually cut into that cardstock and use more than a 1" snippet of ribbon at a time. And you might just actually give something away that you've made. I know you make fun stuff and then you don't give it to anyone. Stop doing that, loosen up, shop with a theme in mind. 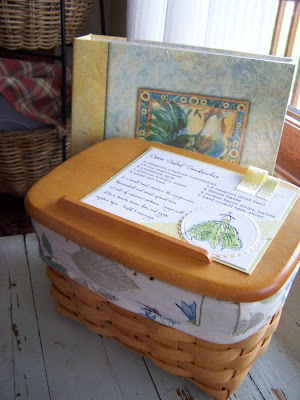 Keep it all together in an Inspiration Station or a special 12 x 12 plastic folder. Now on to the project. Josey got invited to an older girls birthday party, which is huge. Brittney will be 13 and loves her I-Pod and all things paper. We took her shopping with us one day at the mall and she whipped out this notepad with the things she needed. As we purchased shorts, shirts, etc there was Brittney crossing off her list. Great girl!! 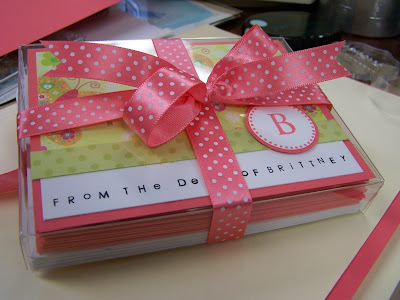 So instead of the typical junk that you buy for birthday gifts, I decided to make Brittney some personalized stationery. 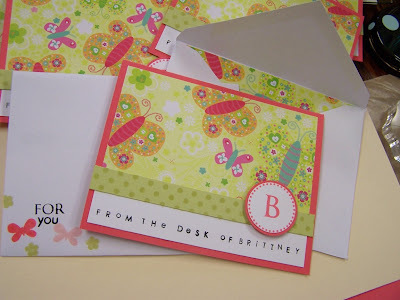 Brittney loves butterflies and the color pink, great ideas to start with. I selected a butterfly patterned paper and Papertrey Ink cardstock, stamps and ink. For the stamps, I used: Polka Dot Basics, Borders and Corners Circles, Butterfly Kisses, Simple Alphabet, Trajan Monogram, Paper Tray. SIX sets? Yes, but you'd never know it right? Hoarding Tip #2: Stop purchasing the cheapo dollar stamps and stuff that you won't use....but you just had to have because it was a good deal. Instead, invest in quality products that mix and match together well. All of the different stamps I used work together because they are timeless, simple in design and compliment each other well. Below are all the bits and pieces of my project, all stamped and ready to be assembled. Hoarding Tip #3: Mass produce once a in a while. If you make more than one of something, you'll be more likely to give it away since you can keep one for yourself. 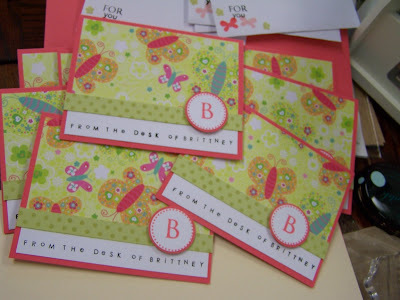 But for this set of stationery, they're all for Brittney.....since my name is not Brittney. 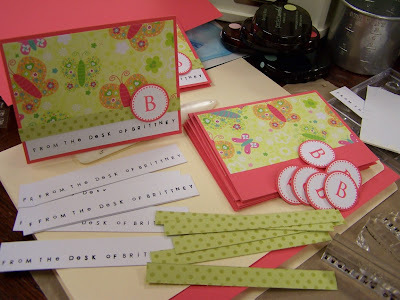 For the card fronts, I adhered my patterned paper, added the white strip with the sentiment *from the desk of Brittney*, the polka dot strip and the circle with the monogrammed letter B.
Hoarding Tip #4: Purchase less expensive items when it makes sense. 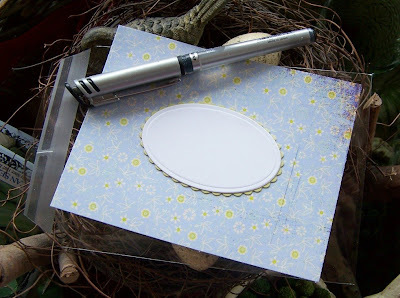 Here I used some less expensive envelopes but I fancied them up with piece of patterned paper to make envelope liners. 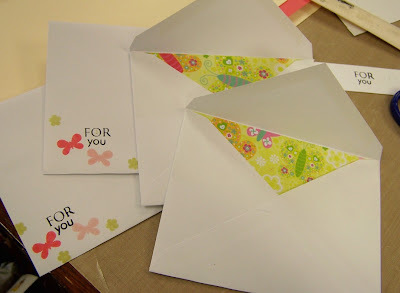 And I customized each envelope with additional butterflies, flowers and the *for you* sentiment. They look fancy schmancy, huh? Here's card with the envy, showing the front and inside of the envelopes. Hoarding Tip #5: Packaging is everything. Don't skimp on the packaging. If you make a great creation and put it in a paper sack, it will look like crap. However, if you make the packaging look great, no one will know that your set of 8 cards cost you just a couple bucks to make! 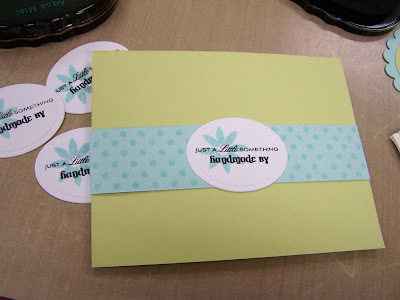 Here I used a clear stationery box from Papertrey Ink along with some ribbon that matches the cardstock color. Berry Sorbet is the delicious flavor of the day for the cardstock, ribbon and ink. And Hoarding Tip #7: Don't try to buy teenage or pre-teenage girls dorky, cheap gifts. They will not like them. They will probably tell you they don't like them. Go for the cute stationery set and a gift card to Target!! 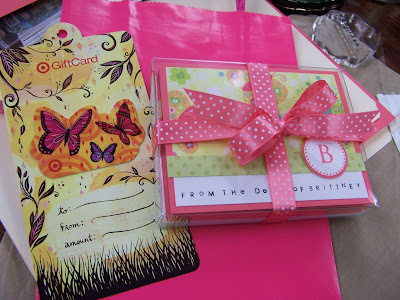 Looky what I found, a gift card with butterflies! Okay, that is crossed off my list. I'm going to have Josey fill out the gift card and help make a birthday card after school. Then we'll package it all up in the pink gift sack with some cute tissue and we're good to go. I wish I could be there when Brittney opens her gift....I know it will be one of a kind! And skating at the skating rink too? Oh man, what fun!! And the satisfaction to hear my girls say *Mom, you're the best mom ever!*?? PRICELESS!!!!!!! Scrapbook weekend here I come! Lockhart Bouquet..this card has it all!